Dark Matter - what on earth is it? Dark matter is a weird substance that is invisible and undetectable. It is thought to make up around 80% of all the matter in the Universe - but what is it? And, if it can't be detected, how do astrophysicists know it's there? We initially go back to 1932 and observations by Dutch astronomer Jan Oort (after whom the Oort Cloud is named) on the motion of stars in our own Milky Way galaxy. Their motions weren't right, given the amount of gravitation generated by the galaxy as a whole. This was taken a step further by Swiss astronomer Fritz Zwicky in 1933 when he studied gravitational anomalies in galaxy clusters. Both concluded that, to account for these problems, there must be some other form of matter intertwined with normal, visible matter, that we can't detect or observe. Subsequently, this mysterious stuff was christened "Dark Matter". Put simply, stars near the centre of a galaxy should be orbiting much faster than those out on its edge. What was observed was that those stars on the edge were also orbiting at a fast velocity. The only explanation that didn't violate Newton's law of gravitation was that there had to be some extra, unseen matter within the galaxy, creating the extra gravitational force. 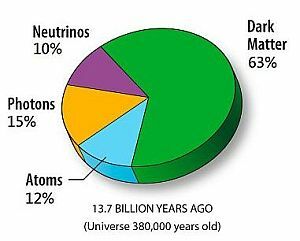 Using complex, modern-day observations, it is possible to calculate the percentage of dark matter in the Universe both today and as far back as 13.7 billion years (when the Universe was only 380,000 years old). As you can see, when the Universe was very young, two-thirds of it was made of this mysterious stuff. It is thought that it was initially responsible for drawing visible matter together to form the stars and galaxies. 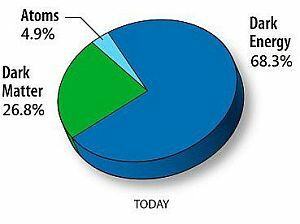 Nowadays, the composition of the Universe is dominated by yet another mysterious thing called "Dark Energy". The Dark Matter now comprises only a quarter of the Universe, but it's still five times as much as normal matter. Further study has revealed how this stuff is distributed throughout the Universe, both by computer simulation and direct observation of the behavior of galaxies. The findings suggest that it forms a connecting web between and amongst galaxies holding them in much the same way as a spider's web holds a fly. As it is present in all galaxies, it must be prevalent in our own Milky Way, so it follows that our Sun and, therefore, Earth must constantly be passing through it. True to form, astrophysicists then set about trying to find evidence of this. An experiment was set up, far underground in the town of Soudan, Minnesota, USA, called the Cryogenic Dark Matter Search. It consists of a series of cells made from the element germanium. The idea was that dark particles would pass straight through the earth and, on striking the cells, would produce tiny amounts of energy in the form of heat. So far there have been only two occasions when this might have happened. An ongoing experiment, then. So, What Actually Is This Stuff? There have been a couple of theories as to what dark particles might be and it is here that the art of the acronym really comes into its own, as you'll see. This is an acronym for "MAssive Compact Halo Objects" and includes various things found in the Universe that we can't possibly see, but are composed of real matter, as opposed to dark. Examples could be brown dwarf stars, neutron stars and black holes. Unfortunately, the maximum possible amount of mass from all these things doesn't come anywhere close to the amount necessary for it to be Dark Matter. So this theory has generally been discarded. These are "Weakly Interacting Massive Particles" and the prevailing theory is that they are the dark particles. So, what are they, exactly? Well, for a start, they're hypothetical. Yes, just made up. But they've been given very exact characteristics. They interact only through the weak nuclear force and gravity. They do not interact with the electromagnetic force (which includes light), which is why we can't see them and also not with the strong nuclear force which means they can pass unhindered through solid matter. Something out there is causing the gravitational aberrations in the Universe and these WIMPs are as good an explanation as any. Firstly, let's consider the fact that dark particles are totally undetectable. What could this mean? That they obey a totally different set of physical laws? And where might you find these different laws of physics? In another universe? The proposal that dark particles might be "leaking" from another universe is not as far-fetched as it sounds. More and more scientists are coming round to the idea that there is at least one other universe besides our own, maybe a whole host of them. In fact, certain physicists are claiming to have actually proved their existence. So, most of the matter in our Universe might have come from another one! It's a good job as well, as, without it, the Universe would just fall apart. In a 2015 study, astrophysicists utilised the Hubble Space Telescope and the Chandra Radio Telescope to study 72 examples of galactic collisions within galactic clusters. Hubble studied visible light, Chandra was able to "see" X-rays. They were watching out for the behaviour of stars, interstellar gas and dark matter under these circumstances. The latter could be observed only by its gravitational effect on its surroundings. What they found surprised them. The gas clouds merged and ground to a halt, as expected; the stars sailed past each other, except where they collided to form one larger stellar object, as expected; but, the dark matter appeared just to sail through all the upheaval, without reacting with anything at all, not even itself. One result of this study is the realisation that dark matter is not some weird version of "ordinary" matter, but something very different indeed.